Following the precedent set by the pack-in earbud that comes with the console, Gioteck’s AX1-R keeps things simple and clean, adding value without breaking the piggy bank. 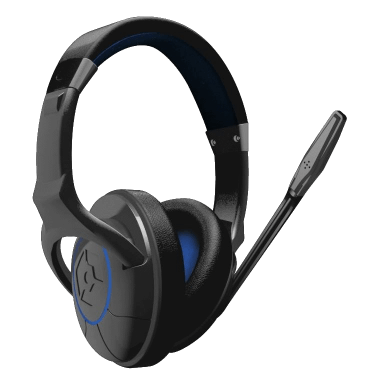 The Gioteck AX1-R is one of Gioteck’s more affordable entry-level headsets. It’s an over-the-ear headphone with a microphone. 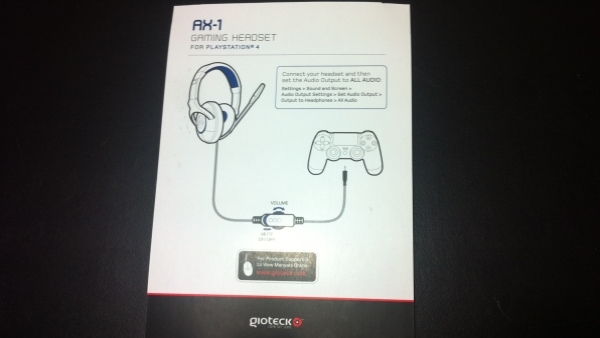 The model I reviewed is exclusive to the PlayStation 4, but Gioteck also makes an AX1-R for the Xbox 360. When I first got the AX1-R’s box in my hands, I was impressed with the packaging. * The black and blue color scheme compliment one another nicely while. The blue utilized on the packaging helps convey to consumers that this is, indeed, a PlayStation-focused product. With anything below optimal lighting conditions, however, the blue is hard on the eyes as it’s almost too dark to read without an additional source. That said, the outer packaging itself was a high grade cardboard with a catchy font and some eye-catching images of the headset itself. Once I cracked the box open, I was greeted by budget packaging. The headset itself sat inside a box made of blue folded cardboard that held the instruction manual. Somewhat to my dismay, it was merely sitting loosely in the box, free to jostle around while the unit is in transit and, potentially, allowing damage to the unit. It had an air of being much classier than the molded plastic of other budget peripherals, but left much desired compared to more expensive headsets. The AX1-R follows suit with many other headsets for the PlayStation 4 by hooking up directly into the port on the bottom of the DualShock 4 controller. The simplicity of the system itself is beautiful, reducing a hopeless, tangled cacophony of cords and wires to a single, easily manageable plug that directly from your head to your hands. One of the inherent downsides, however, is that the AX1-R and other headsets that utilize this method are restricted to stereo output. Audiophiles craving a more immersive aural experience with surround sound will be disappointed, not only in the AX1-R, but in any headset that goes through the Dualshock 4, meaning they’ll either have to settle for stereo or research more expensive alternatives. The cable that runs from the headset to the controller is made of good, durable plastic. The cable is flat, which helps reduce or even eliminate tangles. The cable itself is around five feet long, offering plenty of wiggle room for even the largest of wingspans. Situated about 18 inches down the from the headset on the cable is an inline control unit. The unit has a big volume control knob, giving you the ability to adjust the volume without having to get in and goof around with any settings on the machine. The inline control box also features a push/pull mute control, allowing you to mute yourself with just a quick tug. This also runs the risk of inopportune muting, but the feature itself is one I’ve not seen very often and it’s both intuitive and reliable. The headband itself feels well constructed for its price range. The band itself is made of plastic with a matte black finish. Unfortunately, the plastic in the unit feels like it wouldn’t be able to withstand a lot of torque or punishment, so I would recommend taking care when not using the unit. On the top of the headband, there is a sizable leather pad. 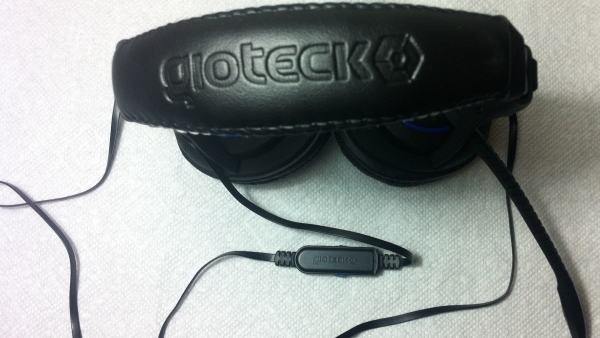 It features the Gioteck name and logo in black on the external-facing portion, while the inside portion is a PlayStation-esque royal blue. The top pad offers a great deal of comfort, ensuring nothing on the unit is digging into your head or rendering the unit unbearable after a couple hours of play. The speakers on the unit feature 40mm drivers. They also feature padded earcups that are comfortable to wear. 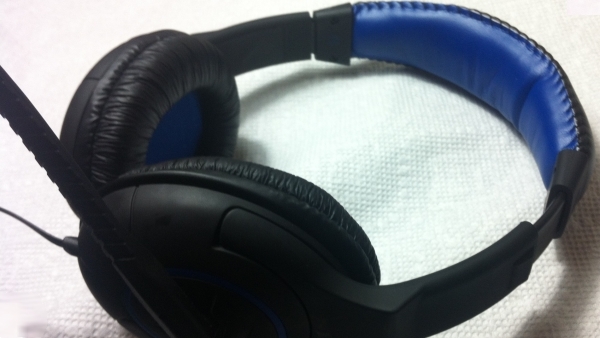 The padded leatherette finish on the earcups is breathable, granting you longevity without sacrificing comfort. It also offers a good deal of noise muffling, though some sound will still bleed through in a louder environment. It’s also a detriment to the headset that the earcups do not swivel. This restricts comfort to a degree and could likely have been implemented without incurring much extra manufacturing cost. Setup is very simple. Just plug into the controller and switch up some PS4 audio settings. The microphone on the AX1-R is situated on the left earcup of the headset.It features a 180 degree range of motion on the arm, letting you move it from totally vertical above your head to straight down near your throat. It clicks into place at each interval, giving the microphone stability while you play. The microphone arm also allows you to adjust how near or far it is to you by simply moving the swing arm. The problem with it, as with most headsets in this price range, is that the headset is locked in to the left side of your head. Where some headsets allow a greater range of rotation (thus letting you rotate the headset and the side the mic is on), you only have one option here.The vocal output from the microphone in the AX1-R is excellent, ensuring your voice is heard loud and clear across the network. The directional mic also does a great job restricting background noise. 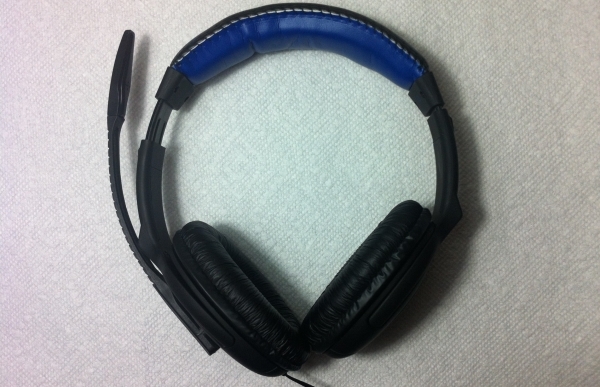 As with any headset, the audio quality is one of the most important factors. On this front, the Gioteck AX1-R does not disappoint. Whether watching movies or playing games, the quality of the audio coming through the stereo speakers sounds excellent. Voice, gunshots and explosions, music and more all feel like they’re coming from a high quality device with a rich, vibrant quality. The whining and crackling some other headsets output is completely absent here. The one issue I experienced with the AX1-R’s output is one I expect many controller-to-head units will suffer, with the voice chat and game audio crossing over. On more than one occasion I couldn’t understand my teammates because gunfire was drowning them out. This can be frustrating and will likely have to be adjusted game to game. 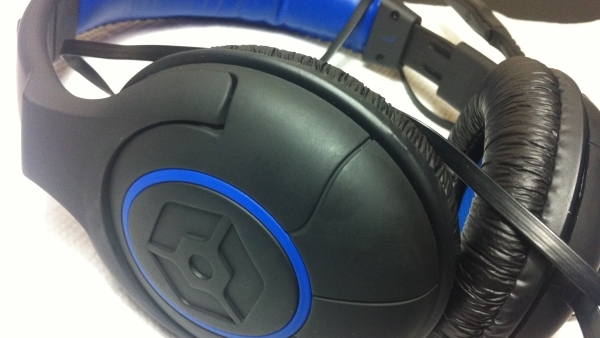 For $40, the Gioteck AX1-R is a great entry-level headset on the PlayStation 4. It’s very easy to setup, comfortable enough to wear for hours with no issue, and the quality of both the microphone and stereo sound are excellent. The plastic the headset is made out of feels a little flimsy and fragile, the lack of swiveling earcups is quickly noticeable, and the headband could have been slightly larger, but overall the unit is well made, comfortable, and sounds great .The AX1-R is a headset you’ll definitely want to consider. *Be sure to check out the unboxing video for the Gioteck AX1-R below this review.